Kids App of the Day is the best solution if you want free kids apps. Every day you can download a paid kid’s app free. Download Kids App of the Day today! There’s a welcome gift waiting just for you as well as a special offer on one of our best apps from the Android Play Store. If you will activate the PUSH Notification then every morning you’ll get a notification of the free Kids app of the day that you can download for free in no time! If you like our app, please don’t hesitate to rate it and leave us a comment. We are always interested to hear what you think. Every week, Kids App of the Day experts review, test, and evaluate hundreds of Google Play Store apps and only save the very best ones for you! We select the best free kid’s apps, that haven’t reached the charts, so you can discover apps that no one else has downloaded yet! We look for high-quality free kids apps. These apps are free games, but also free apps. Our extensive experience online will let help you discover new and original applications. Thanks to the Kids App of the Day selection, enjoy 24/7 access to every kind of application: whether entertaining, instructive, or educative, they're always useful. 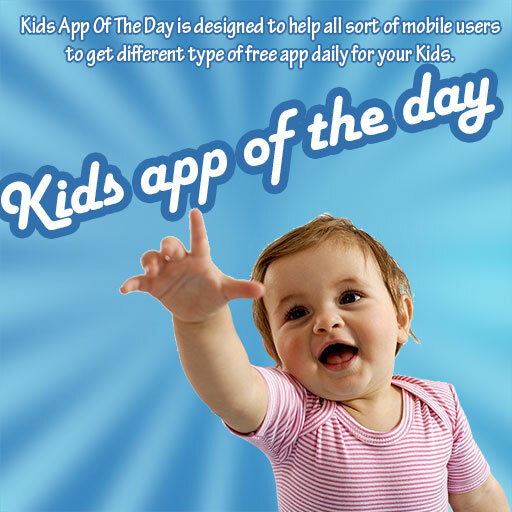 The concept of Kids App of the day offer works because it’s a win scenario, both for the developers as well as the users. The users can download the App Store’s best paid applications free of charge. In one year, the savings from Kids of the Day can be greater than $3000. For the application developers, Kids App of the Day represents the best way to make their application known and quickly enter the famous Top 25 of the App Store. To start downloading paid kids applications free of charge, simply download ‘Kids App of the Day’ free of charge from the App Store. You may than check the application every day and discover the free application of the day which is otherwise paid, but made free for 24 Hours. Then, you can legally download the app free of charge from the App Store.